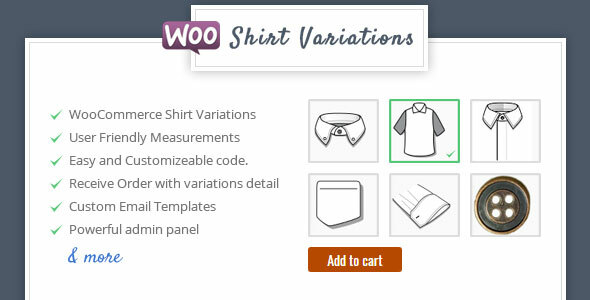 Shirt Designer is a premiere WooCommerce plugin for variations with images. It is enriched with excellent features including unlimited customizers, online design and submission, email notifications, measurement submission for each order and a lot more. The excellent and robust code is backed up by contemporary and user friendly design which is almost ready made for tailors and businesses/shops. This plugin introduces an easy to use and affordable online product designer. Using our plugin the retailer can add options for various design styles for each customizer and users can design and customize their proudcts by selecting different design patterns as they get the freedom to choose every component. We have found the perfect balance between usability, design and code robustness. Tailor Online is a powerful plugin which is affordable and ready made for online custom design and tailoring. It is fully responsive and works perfectly on all devices. -- Best WooCommerce Plugin for variations with images.